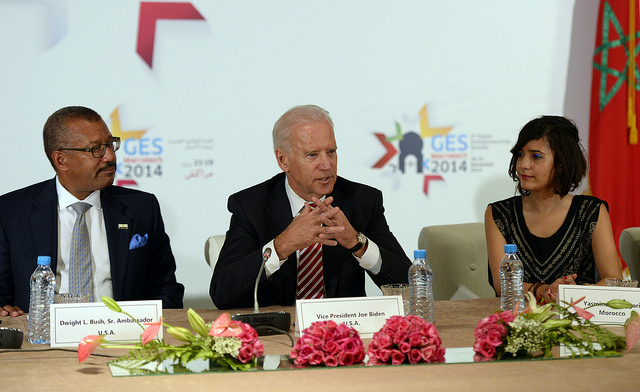 The fifth Global Entrepreneurship Summit kicked off this week with a meeting between Vice President Joseph Biden and King Mohammed VI and opening remarks by Secretary of Commerce Penny Pritzker at the Summit’s Women’s Entrepreneurship Day event. Held in a special tented facility in Marrakech, the Summit, which seeks to promote greater support and resources for entrepreneurs, especially in Muslim-majority countries, has brought together more than 3,000 private and public sector participants. In an article in the Washington Post, Vice President Biden was quoted as saying, “The secret people don’t know is that our diversity is the reason for our incredible strength. But the world and the United States will be more peaceful and prosperous, when the brightest, the most innovative, the greatest risk takers believe they can reach their potential at home.” He went on to add that every country should understand the benefits of supporting entrepreneurship broadly, for men and women, as both a boon for economic development and an effective tool in combating radicalism and extremism. In his address at the opening of the Summit, King Mohammed VI spoke quite forcefully about the benefits of promoting innovation and entrepreneurism. Reflecting on Morocco’s challenges to accelerate economic growth, the King tied together the notions of social and human development with the role of entrepreneurs. “Entrepreneurship and innovation are twin values; they are both springboards for freedom, social mobility and prosperity, provided the business environment is favorable and the required conditions are met.” He restated Morocco’s commitment to working with the private sector to promote a favorable environment for business to thrive and expressed his belief that it all begins with adequate education. As the Summit proceeds, there are special sessions focused on innovators from Africa, women, successful entrepreneurs sharing their stories and offer support, as well as experts in finance, marketing, business plan development, and the other elements of the entrepreneurship eco-system. It is an opportunity to go beyond showcasing what has been done to investing in future entrepreneurs who can change the business face of many countries.